Amazake drink is the cornerstone of traditional Japanese semi-fasting. 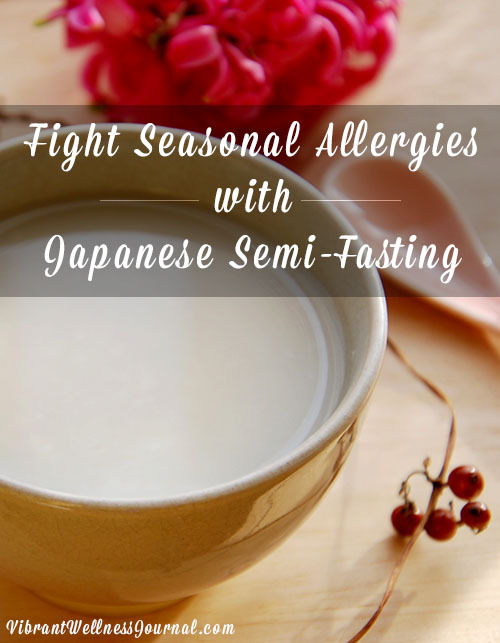 Instead of covering up seasonal allergy symptoms with pills, try Japanese semi-fasting for allergies. You might be surprised at how effective it can be. I LOVE Spring! I can feel new and hopeful energies all over while walking in Central Park every morning. All of those beautiful tulips, hyacinth, young green leaves on the tree branches, and that intoxicating aroma of lilacs! But for some, it’s a tough season, because we suffer from seasonal allergies. You can’t “stop and smell the lilacs,” you might say. From a holistic point of view, though, allergens like pollens are just “triggers” and not the root cause of seasonal allergies. Instead, allergies are signs that your body, especially the digestive organs, is so exhausted by heavy food and overeating that it’s not functioning properly. Related: Eat Your Seasonal Allergies Away! Under this abnormal environment, your immune system starts “attacking” unharmful substances like pollen or even your own cells. There are studies suggesting that allergies are actually related to other auto-immune disorders in this way. In other words, your body is screaming for help! So instead of covering up the symptoms of seasonal allergies with allergy pills, how about giving some “spring break” to your body? Semi-fasting is a traditional Japanese practice that may be able to help give you some relief. In my country, Japan, some people use semi-fasting to recharge and reset their bodies from time to time. It’s a gentler and easier alternative to a total fast that lasts for just one day. All you consume are amazake drink (fermented brown rice), or brown rice porridge. These gentle foods help you stabilize your blood sugar level, ease your hunger, and provide necessary nutrients and energy throughout the day. You can take a small cup of warmed amazake drink (or rice gruel) two to three times a day at regular meal time or whenever you’re feeling low energy or other hypoglycemic symptoms. You eat no solid foods during your semi-fasting period. The point of this semi-fasting is to give some rest to your body, especially your digestive organs and liver so your body will start functioning better. It may take more than one cycle of semi-fasting to cleanse your body for spring. From my own experience, when I eat or drink too much – especially dairy, sugar, flour products or alcohol – I tend to have more allergic symptoms. When I avoid these foods, I don’t experience so much sneezing or runny nose from spring allergies. 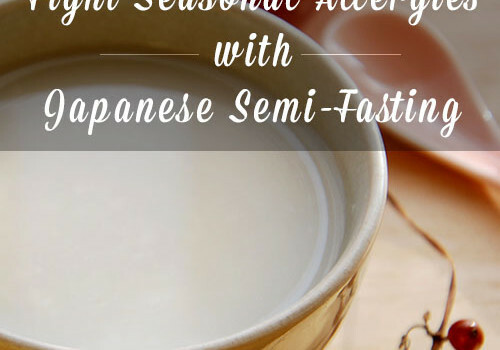 I knew I’d been sort of abusing my digestive organs lately, so I decided to do this amazake-fasting on the last “new moon day”, which fell on April 20th. On the new & full moon day, your body is said to be more attuned to the surrounding energy. My body felt lighter, especially my stomach, and my head was much clearer. And I had such a productive day! I had a great sleep that night and woke up feeling refreshed at 5:30 without an alarm clock! And I felt so rejuvenated throughout the day. I could feel that my stomach, intestines, and liver were all thanking me! As of today – almost a month later – I’m not experience strong allergy symptoms, and I also realized that my skin looks better since then. If not fasting, I recommend you just try to eat less. Especially cut down on dairy, sugar, eggs, meat, oil, and baked flour products. All the “heavy-on-your-stomach” foods. Umeboshi pickled plum, a great digestive aid, has an anti-histamine effect as well, so try half the plum in a small cup of hot kukicha tea in the morning, and see how you feel. Be kind to your digestive system during this allergy season, and you may be able to stop and smell all the beautiful flowers! This post may contain some Amazon Affiliate links; if you purchase something from these links I make a small commission that supports my work and keeps the site running. Thanks for supporting Vibrant Wellness Journal! Other Articles you Might Like! What is Nutritional Yeast? Vegan Gold. Feed Your Genes and Reverse DNA Damage! The content produced by this site is for entertainment purposes only. Opinions and comments published on this site may not be sanctioned by, and do not necessarily represent the views of Vibrant Wellness Journal, its owners, sponsors, affiliates, or subsidiaries. © 2014 Sustainable Enterprises Media, Inc.